A: I chose to look for my next canine buddy at Orphans because it is a local shelter with a large number of dogs in their care at any given time. I already have one dog and thought it would be easier to have him help choose his new friend if we could just go to a nearby shelter and meet several dogs to find the best match. Also, I browsed the Orphans website beforehand and several dogs grabbed my attention right away just from their brief descriptions and pictures. A: I’ve known about Orphans for years from things like flyers for adoption events and through word of mouth. I also like to browse most of the local shelters’ websites and Orphans is one that I have visited with some frequency. A: I wanted to give a home to a dog in need. I had a wonderful experience with my current dog, whom I adopted from a shelter in Indiana, and was happy to repeat the experience of welcoming another shelter dog into my life. I have also volunteered at various shelters throughout my adult life and wouldn’t consider getting a dog from any other source. She must be thrilled with the new snow today! Q: Was Harper your first pet dog? A: This is my 3rd dog. My first dog was a Boxer who passed away in June 2011 at the age of 11. 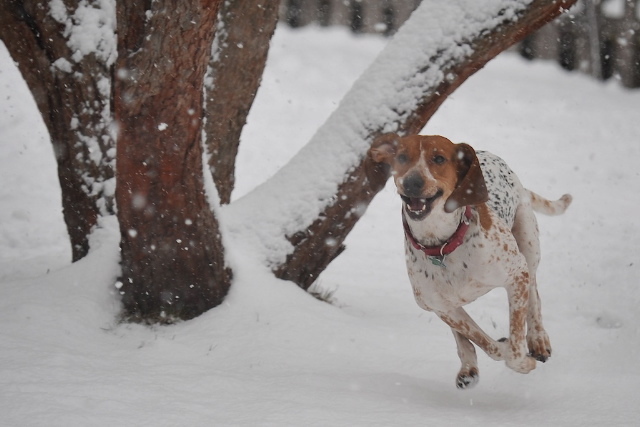 My second and current dog is a 7-year-old Coonhound mix named Hobart. A: I was hoping to find a medium or large hound or hound mix between the ages of 1 and 6. That was what I had in mind when I walked into the shelter, but I wasn’t locked in on those specific traits because you never know who you will connect with once you’re there. 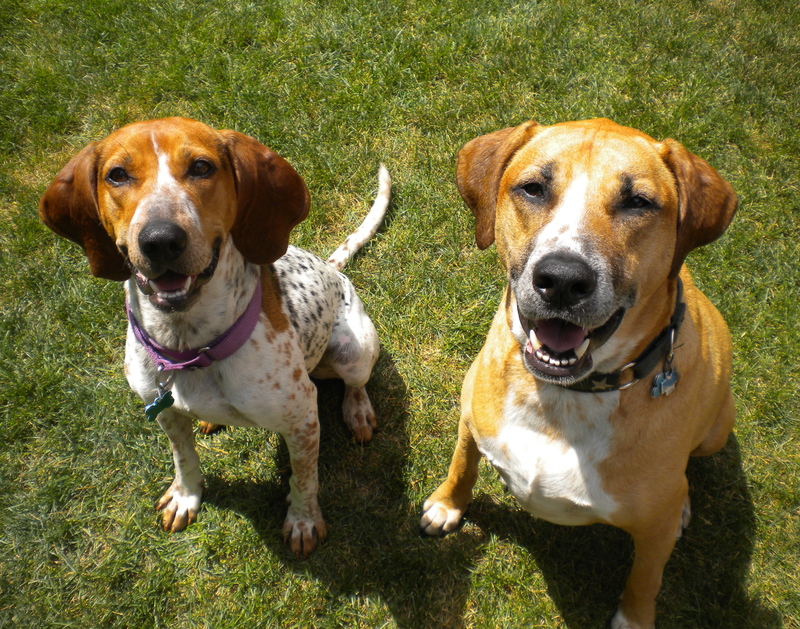 Q: How many dogs did you visit with in one of the off-leash runs before deciding on your dog? A: I visited with 2 other dogs before deciding on my dog. The first one was a smaller hound mix. I had my dog with for each meeting and they completely ignored each other the whole time. The second dog was a Pit Bull mix. We spent a lot of time with him and they were getting along pretty well, but I wanted to keep looking. The third one was certainly the charm for us. Q: What about Harper sealed your decision to adopt her? A: She was everything I had been hoping to find when I went to the shelter that day. She was a 50 lb. 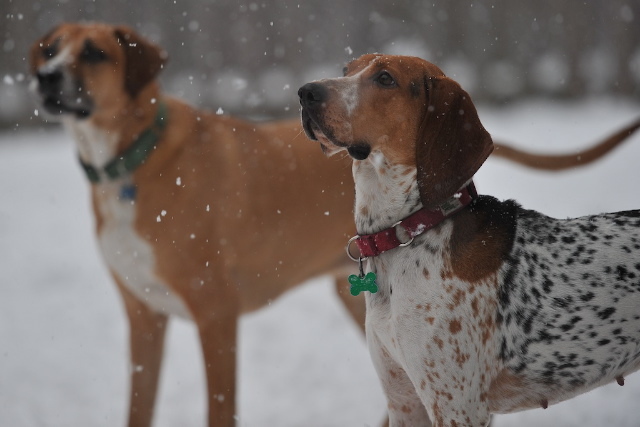 Coonhound at around 4 years of age. However, the most important factor and the thing that really sealed the deal was that she got along great with my other dog. They walked nicely together and then they enjoyed each other’s company in one of the off-leash runs. They were interested in each other and play bowed back and forth. They just seemed comfortable with each other and that’s what mattered the most. 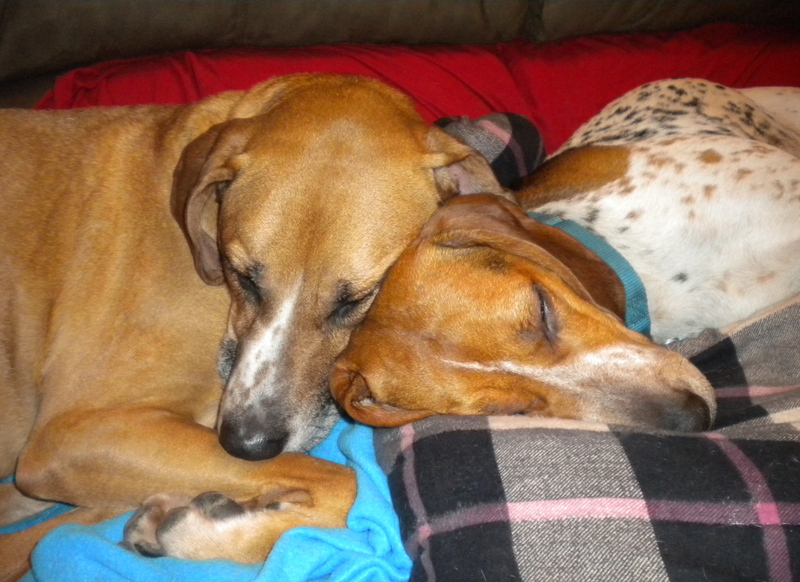 They look pretty comfortable here too! Q: How did Harper respond to transitioning from shelter life to home life? A: She has done pretty well with the transition. Her past is a mystery and she didn’t seem to know too much about living in a house. For one thing, she didn’t appear housebroken and she didn’t seem to know any basic commands. She was a fast learner, though, and was going outside for her bathroom needs within a week and mastered ‘sit’ and ‘shake’ in short order. She was responding to her new name (Harper) almost instantly after I said the name a few times and gave her treats when she would look at me. She also had some fear issues in the beginning and other quirks. As she became more comfortable, she became less fearful. She still has some quirks (don’t we all!) but we have adjusted to each other. She quickly figured out our routine and now waits with her nose pressed to the front door after breakfast because she knows we’ll be heading out for our 3-mile morning walk. I don’t think she’d let us miss a walk for anything! She absolutely loves playing with her canine brother in our big fenced-in yard. She’s also a champion cuddle bug and will be in your lap with her head on your chest in a split second if given the opportunity. Food is a very big deal in the life of a hound and she’s no exception. She basically lives for food, cuddles, and fun. What a life! There’s definitely a learning curve for both the humans and the canines when you add a new member to the family. It can take some time for things to smooth out, but it is so worth it in the end. A: Thanks so much and thank you to everyone at Orphans of the Storm® for providing such great care to the animals as they wait for their new families to find them. Of course they're smiling! They were adopted by Jamie! 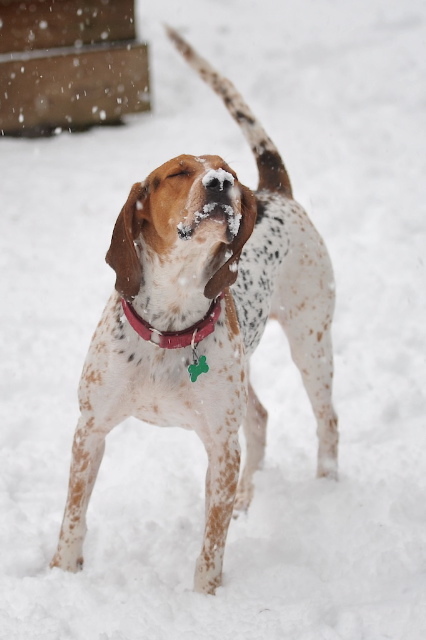 Posted by Meet the Pooches on February 24, 2012 in Interview and tagged adoption, animal shelter, Chicago, dogs, Hound, Orphans of the Storm, pets, snow. Amy, I really look forward to these blogs. Every one is more interesting the the previous. Thanks for helping us spread the word about all of the great dogs waiting at the local animal shelter! love that picture of the two dogs together.